It’s Kansas, 1959. A travelling carnival appears overnight in the small town of Seneca Falls, intriguing the townsfolk with acts of inexplicable magic and illusion. 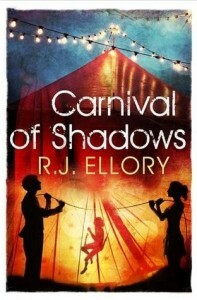 But when a man’s body is discovered beneath the carousel, with no clue as to his identity, FBI Special Agent Michael Travis is sent to investigate. Led by the elusive Edgar Doyle, the carnival folk range from the enigmatic to the bizarre, but none of them will give Travis a straight answer to his questions. With each new turn of the investigation, Doyle and his companions challenge Travis’ once unshakeable faith in solid facts and hard evidence. As the consequences of what has happened become ever more disturbing, Travis struggles to open his mind to a truth that defies comprehension. Will he be able to convince himself that things are not what they seem? Or will he finally reconcile himself to a new reality – one that threatens to undermine everything in which he has ever placed his trust? 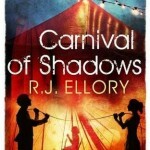 I do love a book that engages my brain as well as my emotions and that is certainly what R.J. Ellory delivers in his latest outing. In a book that’s chock full of fascinating characters, the author takes us on a ride that at first feels like an ordinary murder mystery, but which takes on much more deeper meaning the further you are driven into the story. 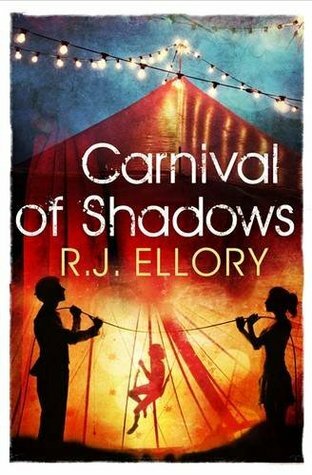 Through a clever plot, ‘Carnival of Shadows’ introduces fascinating themes of trust, belief and the common man versus his ruling authorities. We live in a much more savvy time, where only the naïve truly think that governments act solely with our interests at heart. And by setting the story in a time where such thoughts were all but treasonous, Ellory gives this element of the book a greater significance. It also allows him to deliver hints about the early days of the FBI and its enigmatic architect, J. Edgar Hoover. Michael Travis is a character you will want to get to the bottom of and the mysterious Doyle is surely one of the most charismatic characters the author has ever committed to print. As usual with R.J. we have an all but flawless sense of time and place and he even manages to inject his prose and dialogue with a feel for the age. One could almost believe that this book was written during the 50’s. So, you have a heady mix of mystery, the ordinary man against governmental forces and a book in which you are never quite able to work out what is going to happen next. What’s not to love?